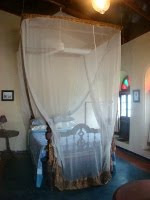 For our night in Stone Town, we stayed at 236 Hurumzi. 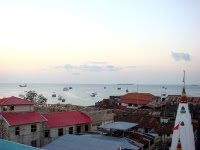 Stone Town is an interesting sort of place and quite run down. I was amazed at how much it reminded me of Essaouira - I guess the Muslim influence in a sea-side African city, perhaps? Our room was quite nice (Varen was thrilled to have air conditioning at the touch of a button!) the only downside was we were in the Tippu Tip room, which is all the way up 4 storeys, in a secondary building ... and dinner and breakfast were in 236 Hurumzi's Tower Top restaurant ... up 5-storeys in another building! Let me just say, that it was quite exhausting getting there and back to the room! After a bit of wandering around town on our own ... and lunch at the famous Mercury's Restaurant (so named since Freddy Mercury was born on the island). The restaurant is fine and on the harbour front. We were accosted by the little kids playing on the beach as soon as our food arrived "Gimme some, gimme some". We had pizza's which hit the spot and then headed back to the hotel for some air-conditioning before our Stone Town Tour in the afternoon. The tour was lengthy and our feet were quite sore by the time we finished it. But it was good and we saw many things from a visit to The House of Wonders Museum (where I later returned to buy a book called Memoirs of an Arabian Princess from Zanzibar, which is a true story written by Emily Ruete who was born Princess Salme of Zanzibar), a look over the Old Fort from the top balcony of the House of Wonders, a wander past the house where Freddy Mercury's parents lived when he was born (it's now, sadly, a curio shop! 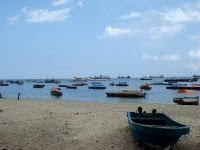 ), via the Anglican Church (consider that there are apparently 45 mosques, 3 churches and 1 Hindu temple in Stone Town!) which is famous as the old site of the slave market and whipping post and even into the old cells where salves were held (the were treated horrendously!) (see the memorial built to remember the slaves in the picture). We also walked past the only 3 traffic lights in Zanzibar (none of which are actually functional!) and thru a market where they sold fish, meat, fruit, vegetables and spices. Just before finishing the tour we also stopped at the Hindu Temple, which was right near our hotel and the most colourful building in all of Zanzibar, I'm sure! It really is a quirky little place to walk thru, with all it's winding streets you wouldn't believe a car would even attempt to fit down (but sometimes the surprise you and do!). After that Varen collapsed and I went off shopping ... for the book I mentioned before (needed to hit the room for some more dollars before I could go spending!) and a bag I'd seen in a boutique window (the only boutique I'd seen too!). 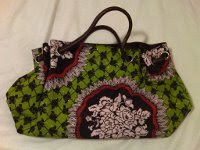 I splashed out on a Doreen bag by Doreen Mashika that I fell in love with and just couldn't resist. Sadly although the exact bag I purchased is now featuring in her ad campaign in a Tanzanian magazine we saw, it isn't on her website yet :( so instead you get this crappy picture taken in bad light by me. But trust me, it really is a lovely bag! I was amazed at how often on this trip we were served the small sweet Vetkoek that I'm familiar with (which is why I was so confused the first time someone told me they ate them filled with mince!). This is also the first holiday where I haven't spent or handled even a cent of local currency (Tanzanian Shilling), we used purely US Dollars. Pretty bag and a lovely sounding holiday - lucky lady!